Walnuts blood pressure bring new findings about an omega-3 link. Walnuts blood pressure bring new research finding about an omega-3 link. This page was updated on 1st November, 2018. Nine walnuts a day (and a couple tablespoons of walnut and flaxseed oil) keeps the doctor away! Vegans have difficulty getting enough of some omega 3 fatty acids for their anti inflammatory effect. However, Penn State researchers have now found that a combination of walnuts and flax seed oil significantly lower diastolic blood pressure and decrease C reactive protein, a key inflammatory marker. A diet rich in walnuts and its oil may prepare the body to deal better with stress, according to a team of researchers who looked at how they together with flax seed, which contain polyunsaturated fats, influence blood pressure at rest and when under pressure. Previous studies have shown that omega 3, like the alpha linolenic acid found in walnuts and flax seeds, can reduce low density lipoproteins (LDL), the so-called bad cholesterol. These foods may also lower C reactive protein and other markers of inflammation. The difficulty is that there is a marked difference between two very different LDL molecules. Those that are small and dense can permeate the inner layer of arteries, whereas those still carrying their fatty component cannot; these latter are not damaging. You can read more about the different kinds of fats at olive garden nutrition. "People who show an exaggerated biological response to stress are at higher risk of heart disease," said Prof West. They set out to discover if omega 3 fatty acids from plants would reduce the catastrophic effect of exaggerated cardiovascular responses to stress. The researchers studied 22 healthy adults with raised their LDL, the "bad" cholesterol. All meals and snacks were provided during three periods of six weeks. They found that including walnuts and the oil in the diet lowered both resting blood pressure and BP responses to stress in the laboratory. Participants had to give a speech or placed their feet in cold water to stress their bodies. Interestingly, adding flax seed oil to the walnut diet did not further lower their blood pressure. Perhaps it isn't the omega-3 ALA that is the active ingredient. "This is the first study to show the walnuts blood pressure connection during stress," stated Prof. West. "This is important because we can't avoid many stressors in daily life. This study shows that a simple dietary change - eating walnuts - will help us respond better to stress." A subset of the participants also underwent a Doppler ultrasound scan in order to measure the effect on our arteries. Adding flax oil to the walnut diet significantly improved this test of vascular health. Linseed oil is so named after it's most prodigious component, alpha linolenic acid, or ALA. It's an omega-3 fatty acid. It also has a small amount of linoleic acid, something quite different. Linseed is simply another name for flax. 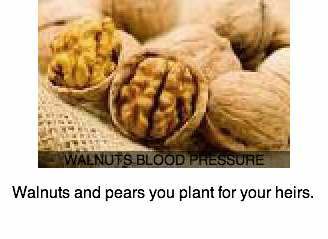 When added to walnuts blood pressure it made a winning combination. There are three omega 3 fatty acids. Two are found mainly in fatty fish and krill, and the third, ALA, in vegetable products; the richest and easiest to obtain is freshly ground flaxseed; perfect for vegetarians. It's not as effective though. The oil in flaxseeds is over 50% omega-3, Alpha Linolenic Acid (ALA). Grinding flax seeds ... so easy. Flax seeds nutrition information talks about the omega-3. Important for arthritis sufferers is that the flaxseeds plus walnuts diet also lowered C reactive protein, an arthritis marker, indicating an anti inflammatory effect. According to Professor West, that could also reduce risk of heart and blood vessel disease. It's worth noting that the FDA in July 2015 gave new instructions to all drug companies marketing non-aspirin anti inflammatory drugs, that there is an increased risk of heart attack, heart failure and stroke with drugs such as ibuprofen, naproxen, diclofenac and celecoxib. What's more it can occur as early as the first week of taking an NSAID. Anti inflammatory drugs can often be avoided if you let your food be your medicine. Should you experience chest pain, shortness of breath, sweating, weakness on one side of the body or slurred speech, immediately stop all NSAIDs and get to the emergency rooms. It's worth noting too that over half of the patients in most chiropractors' offices are consulting them for arthritis related conditions. Whilst iatrogenic disease occurs in the chiropractic setting too, it's extremely rare that it has the devastating side effects of NSAIDs. It's questionable whether it's good practice to have a manipulation of the upper cervical spine whilst taking NSAIDS. Add freshly ground flaxseed to your cereals and homemade bread and baking. an average American diet - without nuts - that reflects what the typical person in the U.S. consumes each day. (peanuts are not really nuts). The 2nd diet included 1.3 ounces of walnuts (9 walnuts) and 1 TBSP of walnut oil in place of some of the fat and protein in the average American diet. The 3rd diet included walnuts, walnut oil and 1.5 TBSP of flaxseed oil. The three diets were matched for calories and were specifically designed for each participant so that no overall weight-loss or -gain occurred. The walnuts, walnut oil, and flax oil were either mixed into the food in such offerings as muffins or salad dressing or eaten as a snack. After each dietary period, the participants underwent two stress tests. In the first test, they received a topic; and they were given two minutes to prepare a three minute speech, which they had to present whilst being videoed. For the second stress they submerged one foot in ice-cold water. Throughout the tests they measured the participants' blood pressure. Results showed that average diastolic blood pressure - the bottom number in 120/80 which is the pressure in the arteries when the heart is resting - was markedly reduced during the periods when they were eating diets containing walnuts and walnut oil. Walnuts are a rich source of fibre, anti-oxidants, and unsaturated fatty acids, particularly alpha-linolenic-acid, an omega 3 fatty acid. It's thought that some of these compounds may be responsible for the beneficial effect of walnuts on blood pressure. Flax seed oil (aka linseed oil) is also rich in omega 3 fatty acids, but this study did not test whether flax oil alone could reduce the response of the heart and blood vessels to stress. Anti inflammatory omega 3 gives walnuts their powerful effect on blood pressure. "These results are in agreement with several recent studies showing that walnuts can reduce total cholesterol and blood pressure." "This research also suggests that blood pressure is more stable when a person is exposed to the stresses of daily life." Whilst I know of no similar research with pecan nuts, they too are rich in omega-3, ALA, and may have a similar effect to that of walnuts blood pressure. 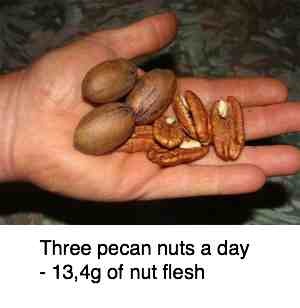 Pecans nutrition may also help with blood pressure. Personally I'm skeptical about big pharma's guidelines about medication; they have such a checkered history of fudging the figures to increase their profits. However, blood pressure medication I recommend without reservation as a chiropractor to my patients, despite the chronic cough they sometimes cause. The president of the international stroke foundation recently stated at a conference in Cape Town that South Africans usually require two different medications to control BP. But when should you start taking them? These new BP guidelines from JAMA which came out in 2014 make a lot of sense. Older than 60? If either of the figures in your BP is over 150/90. Younger than 60? If either is over 140/90. If you have kidney disease or diabetes at any age? 140/90. It's a proven fact that many patients become anxious when having their BP taken. I refused to adjust the neck of a patient recently, using only very gentle chiropractic techniques that happily she responded well to. Her BP was 190/105 on medication; she is significantly overweight, but in fact she has white coat blood pressure. However, her GP assures me that if you allow her to sit and read for half an hour, it drops to 135/90. Maybe so, but I still don't adjust her upper cervical spine! And I've encouraged her to read this page about walnuts blood pressure. White coat BP is just a stress reaction, and even if it drops to normal when non stressed, it's a serious threat that it rises so high when she becomes anxious. I'm a blood donor; white coat blood pressure, or perhaps a fear of needles gives serious concerns to the phlebotomist, but once home it returns to normal. Suggestion: whilst eating nine walnuts a day may seem intimidating, unlike blood pressure medication that often induces an irritating dry cough, walnuts have no side effects, and are probably a lot cheaper. It is rather more PT, as one really should crack them yourself... if if you ate only three walnuts a day? Should we all be eating a handful of walnuts or pecans every day? I do.